The Pacific Islands Association of Non-Governmental Organisations (PIANGO), the Citizens’ Constitutional Forum (CCF), Migrant Forum in Asia (MFA), Sydney Asia Pacific Migration Centre (SAPMiC), and the Diplomacy Training Program (DTP), organised and facilitated a two-day workshop to enable civil society in the Pacific to provide inputs and recommendations to the preparatory process of the UN Global Compact on Migration (GCM). 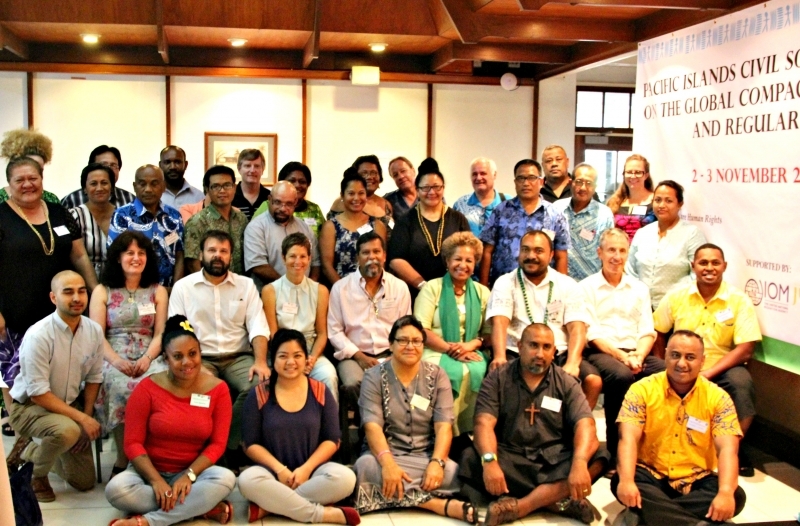 The consultation brought together representatives from NGOs, trade unions, faith-based groups, and others to consider the key issues related to migration in and from the Pacific Islands and the human rights and governance issues raised by this migration. The workshop provided an opportunity for civil society in the Pacific Islands to reflect on particular concerns and issues relating to migration, development and climate change; develop their understanding of the GCM of what it might mean for migration governance develop inputs to feed into the consultations and processes of developing the GCM consider future networking and collaboration in the Pacific on migration and the rights of migrants. The workshop took place in the week leading up to the official regional consultation taking place in Bangkok (UNESCAP) between governments in the Asia-Pacific. The UN Global Compact on Safe Migration will be adopted by the UN in November 2018 following thematic and regional consultations with governments and stakeholders.